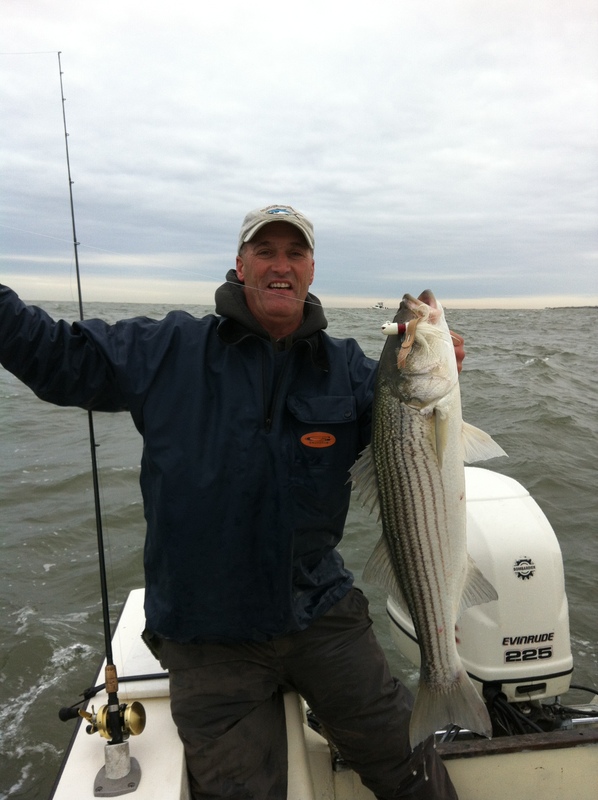 I am sure most of you are aware of the effects of Hurricane Sandy, and it has really put a damper on the early part of the Fall Striper Run in NJ. That being said, it truly has devastasted so many people, and I feel fortunate that I personally still have a place to live and am able to fish after what i have seen from New York and Northern NJ. I haven’t been out at all this Fall Striper Season, and I was excited to get back on the water after almost of month of being on land (longest streak on land for me in years). 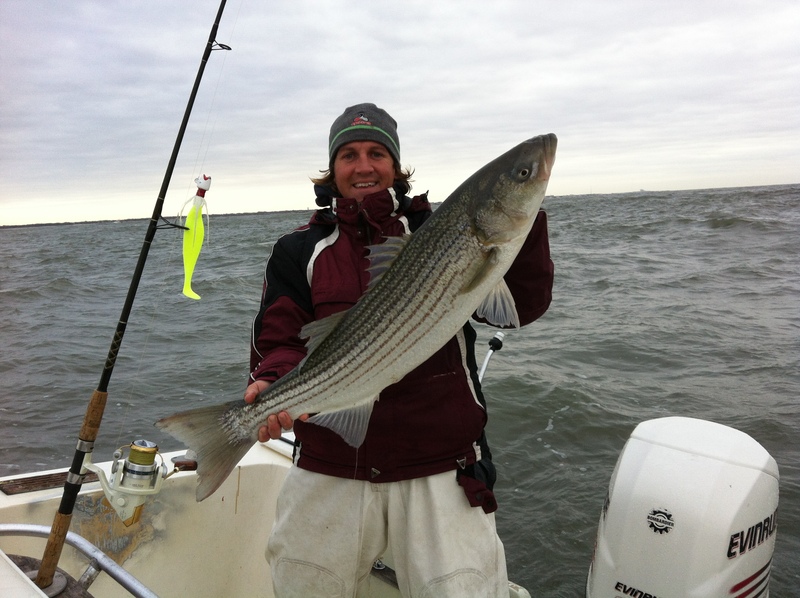 After a decent report from Prissy Wicks (Cape May Rips) my friend Vinny and I wanted to spend the day tossing bucktails in the Rips for Striped Bass. This is by far my absolute favorite type of inshore fishing. It truly is an art, and there is no feeling like when a striper hammers your bucktail and it starts screaming drag off of your reel after you slam the hook home. We got an early start and dumped the boat in the water at Spicer’s Creek Public Ramp at first light. We were fishing by 6:45am in the middle of the incoming tide and started off searching different Rips until we found a spot that produced a few keeper fish for us. The water temperature was 49 degrees which is colder than the past few years during this time of year. The bite wasn’t consistent so we continued to look around. We tried a few more areas and finally found the school. Every drift we were getting hooked up. We had it to ourselves for about a half an hour until other boats caught on that we were catching and came in, but the bite was HOT and we kept catching even after everyone came in on top of us (very common in the Rips in case you didn’t know). By the time the tide slowed down at 9:15 am and the melee was over, we had caught 16 stripers all ranging from 30-38 inches. We waited out the slack tide (usually unproductive in the Rips unless you troll a little or know where to move during certain stages of the tide) by eating an early lunch on the boat then went back at it for the top of the outgoing tide, but we only had a few bites without any connections. We decided to quit while we were ahead and got back into the boat ramp before the tide got too low to get the boat back on the trailer. The hot baits were 3oz. white ‘smilin bill bucktails’ ,also known as the ‘Andrus Rip Splitter’, with either a pork rind or a 6″ chartreuse sassy shad. This is pretty much all we ever throw in the Rips, and it has produced for us year after year. 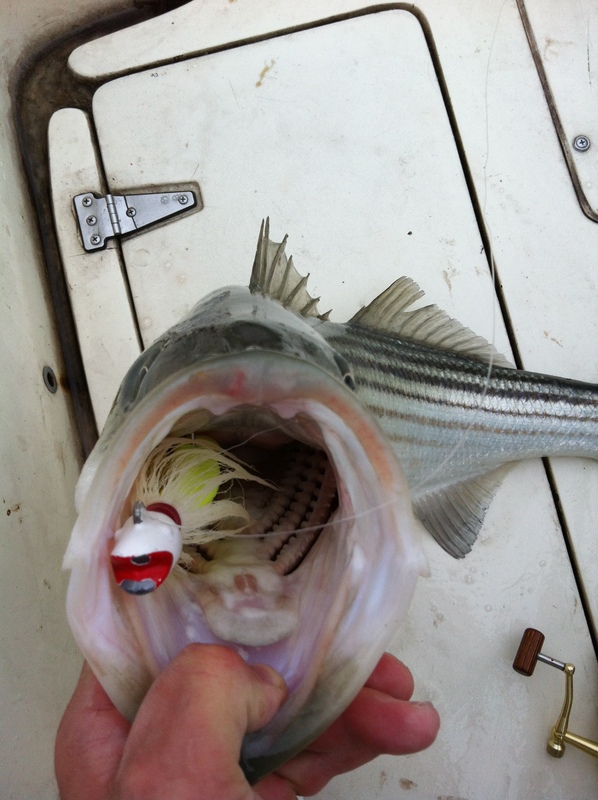 It amazes me how they inhale this lure almost every time! This post is wayyy late, I know, but had to throw it in. I captained Maureen Klause’s boat Trade In for back to back trips line class fishing for Mako Shark. We have been pretty successful doing this in the past when water temps were 65-68 degrees in October, usually around a Full or New Moon. We had water temps around 63 degrees and green water both days. Day 1 we fished around a wreck called the Cayru on the 20 line and struck out. We worked a couple of different lumps in the area on three different drifts without any action. Day 2 We fished further south on the 20 line in the general area of the 28 Mile Wreck. The first drift we had a small shark that we could not get close enough to identify that just checked things out. Our second drift we had a better sized Mako in our slick that just never cooperated then shortly after we had a small mako take the bait we wanted it to, but spit the hook after 5 minutes. That fish would not have been legal anyway, so we weren’t heartbroken, but it was nice to get a little action.